Collaborative care is a healthcare model which aims to improve patient outcomes through inter-professional cooperation. This will commonly include a primary or tertiary care team working with allied health professionals – such as dieticians, physiotherapists or mental health professionals – or medical specialists. Effective collaboration encourages patients, families and healthcare providers to be active participants in the treatment process which in turn promotes improved quality outcomes, improvements in patient experience, patient safety, and effective use of resources. Some of the hallmarks of collaborative care involve prioritising patients, commitments from those in leadership positions to ensure inter-professional collaboration, effective communication across the team, and contributions from practitioners who are all equally and highly experienced (1). Nurses are the only clinical professionals who are specially trained to understand the roles of other healthcare providers, this training provides a strong foundation for successful collaboration. Effective communication is critical for a collaborative care plan to work; nurses are trained to have adaptability, empathy, and communication skills, which allows for them to be excellent leaders and members of a care team. Nurses’ ability to understand and assess a patient’s clinical, emotional, and social needs can help them to call upon available resources and create a patient-focused care plan. As nurses are offering direct patient care around the clock, they have a unique and focused view of how that care should be provided. Nurses can be role models in their honest and open communication with team members about the quality of patient care which is being provided and the work environment. 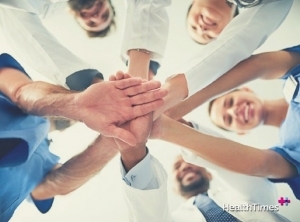 Collaborative care has proven to be highly beneficial for nurses, patients and overall performance of healthcare teams by increasing patient safety and also providing nurses with valuable healthcare experience and insight. Such outcomes can only suggest that the use of collaborative healthcare teams will increase in numbers across hospitals around the country to provide optimal services to patients in the future.